Capacity : 1 to 2 trolley(s) depending on 6 to 10 levels. with grills of 600×800. Dry heating 30 or 36 kW depending on installation. Steam production(opional) depending on the application. Dual speed, high performance ventilation system with vertical air flow. Maximum temperature of 130°C. For cooking, pasteurising and roasting. 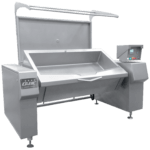 Capacity : 2 trolleys of 6 to 12 levels with grills of 600×800. 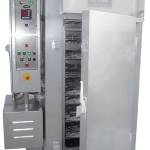 Dry cooking 54 kW or 81 kW depending on installation. Steam production (optional) depending on the application. With horizontal air flow. 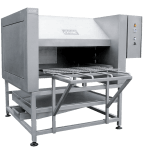 Maximum temperature 250° C.
Capacity : 1 to 12 trolleys 1000×1000 height 2000.Dry heating by electric elements. 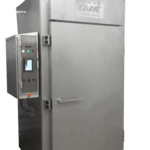 Saturated steam cooking by independent electric steam generator or from factory supply.With vertical air flow. 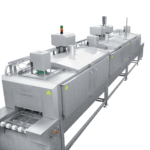 Capacity : from 1 to 8 trolleys 1000×1000 height 2000.For thin products as fish filet, pack meal, spéciality and other various..Dry heating by electric elements. 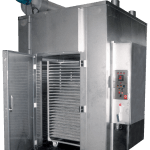 Saturated steam cooking by independent electric steam generator or from factory supply.With horizontal air flow. 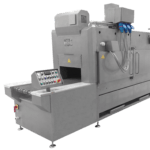 Our combination oven capacity of 2 trolleys 20 levels GN 2/1 to simplify your work. 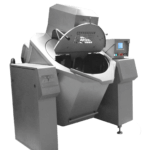 Less manipulation, easier batch tracking, homogeneity guaranteed, all this is possible thanks to the AC700. 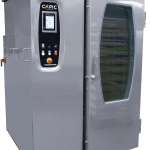 Based on our know-how in the food processing industry sector, this oven benefits from the latest technologies of control cooking, traceability with CAPIC manufacturing quality. Capacity : 500 to 2000 litres (and more). Steam heating, electric, gas. To cook, blanch, brown and cool. 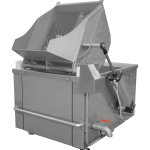 Capacity of the tank : 500 / 1000 or 1500 litres with perforated basket of 250 / 500 or 750 litres.Steam heating, electric or gas.Unloading in european tray of 200liters. 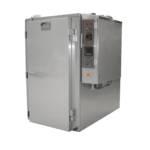 Capacity, 2 models :Model 1100 : Surface of 1 m², useful capacity of the tank 280 L, heating power 36 KwModel 1300 : Surface of 1,3 m², useful capacity of the tank 380 L, heating power 48 KwHeating by electric heating elements.Control of temperature : bottom of tank, bath and core probesRemovable mixing arm with programmable rotation speeds.Two part lid – ingredient portal.Control by touch screen to manage the recipes.Unloading at 700mm from the ground in a 200litres recovery european tray. 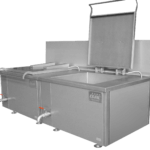 For browning and frying meats, vegetables and also for cooking.Tank surface : 1 m² (1 640 X 700 mm).Total volume of the tank : about 300 litres (depht 310 mm).Heating by electric elements.Digital control panel deported on the side of the right tankControl of temperature : bottom of tank, bath and core probesCounterbalanced lid.Unloading at 700mm from the ground in a 200litres recovery european tray. 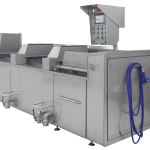 For big line of production cooking and cooling pasta, rice, seafood specialities. 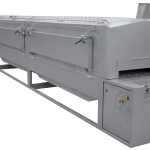 Models 500, 1000 or 1500 with perforated baskets of 250, 500 or 750 litres.Perforation of the basket depending on the application (standard diametre of 1.5 mm for the model 500).Steam, gas or electric heating.Cooling tank to be connected to the cold water networkNumber of cooling tanks according to your needs.Automated cooking/chilling line with secure access. 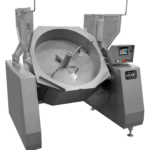 For small line of production cooking and cooling pasta, rice, sea food specialities. 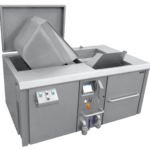 Unit including a cooking tank and a cooling tank of 220 liters each.Each tank is equipped of a perforated basket of 100 liters.Perforation of 1.5 mm.Electric, gas or steam heating.Cooling tank to be connected to the cold water networkControl by touch screen to manage the recipes. Braising on the upper side of the product only.Power requirement 25 kW.Spread of the products on a grill of 500mm X 1000mmAdjustable positioning of infra red heaters. Material adapted for the industrial productions. Braising on the upper side of the product only.Dimensions according to output required (modular design).Power requirement 56 kW per module.Spread of the products on a standard conveyor belt in stainless of 600mm (width)Adjustable positioning of infra red heatersConveyor with adjustable speed. Material adapted for industrial productions.Steam network or independent production.Dimensions according to output required (modular design).Temperature regulation of each module, maximum temperature of 95 °CNo ventilation system.Spread of the products on a standard conveyor belt in stainless steel of 800 mm(width)Conveyor with adjustable speed. Dimensions according to output required(modular design).Electric heating 36/54 kW by module and depending on the model.Temperature regulation of each module, maximum temperature of 250 °C.Spread of the products on a standard conveyor belt in stainless steel of 600 mm(width).Conveyor with adjustable speed.Possibility of steam injection on some models.